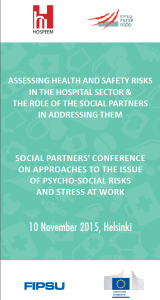 On 10 November 2015 the second conference of the joint HOSPEEM – EPSU project on occupational health and safety risks entitled “Social partners’ conference on approaches to the issue of psycho-social risks and stress at work” took take place in Helsinki (co-organised by JHL, Superlitto and Tehy and supported by EPSU). The conference focused on the causes and impacts of psycho-social risks and stress at work, on how they can be best prevented and addressed and on how an effective risk assessment and management can be organised. You can read the media release of HOSPEEM and EPSU or download the Media Release in pdf. Session 1: “Setting the scene: Causes of psycho-social risks and stress at work (PSRS@W) in the hospital/health care sector”.